PolitiFact's attempt to use an "In Context" item to soften the negative effects of President Obama's "you didn't build that" moment didn't work out so well. More was needed to help the president. Watch how many times PolitiFact uses partial quotations to protect its Obama from having his statement taken out of context. We have two already in the graphic up above ("is the result of government" "hard-working people"). On with the fact check. PolitiFact tells us that the Romney campaign and the Obama campaign have been wrangling over whether the latter insulted entrepreneurs. That issue is somewhat settled when entrepreneurs perceive an insult. Romney wins that point. PolitiFact wants to let us know that Obama did not mean to insult entrepreneurs. And maybe attacking Romney in relation to this issue is the ticket. Romney, in comments at public events and in several ads, has argued that the remarks show a general disdain for business. The Republican National Committee and the National Federation of Independent Business are among the groups have [sic] released their own videos and statements echoing Romney that the president is out of touch. The above summary is fair but potentially misleading. We'll watch for those effects as the story progresses. In one fundraising e-mail [sic], Matt Rhoades, Romney’s campaign manager, decried Obama’s "naïve view that government, and not the hard work, talent, and initiative of people, is the center of society and the economy." The email from Rhoades helps make it plain that PolitiFact distorts the Romney campaign's argument. The argument is that Obama credits the government too much, not that he doesn't credit entrepreneurs at all. Yet the latter is what PolitiFact suggests in its graphic. In another campaign e-mail [sic], Amanda Henneberg, a Romney spokeswoman, said Obama had "denigrated Americans who built their own businesses." Henneberg's statement dovetails with the Romney campaign message that Obama overemphasizes the role of government, but PolitiFact can potentially make it look like she is saying that Obama gives entrepreneurs no credit. The issue has become so big that the Obama campaign felt the need to address the issue head-on in a Web video titled "Tampered" that quoted media accounts saying the quote had been taken out of context. The current size of the issue could mean that the Romney campaign is right that Obama is out of touch. But it would help Obama if it appeared that people were simply misled by Romney about what Obama said. PolitiFact did the Obama campaign a favor, by the way, by overlooking for the sake of this story the Obama campaign video suggesting Obama did not say what Romney quotes him to say. Not only was Obama taken out of context, he didn't even say it in the first place. President Obama recently said: "If you've got a business, you didn't build that. Somebody else made that happen." Clearly, this President doesn't understand how our economy works. In this item, we’ll rate the claim that Obama was saying success "is the result of government," not "hard-working people," when he said, "If you've got a business, you didn't build that. Somebody else made that happen." PolitiFact distorts Romney's claim by taking his comments out of context. Ironic, no? PolitiFact tries to set the stage by asserting that Romney's quote of Obama distorts the meaning of Obama's claim. In effect, PolitiFact suggests this is obvious if one reads Obama's statement in context. But doesn't the entire context of Obama's statement emphasize the role of the government in business creation at the expense of the entrepreneur? How does PolitiFact miss the obvious? We believe, as do our friends at FactCheck.org and the Washington Post Fact Checker, that Romney has seriously distorted Obama’s comments. PolitiFact is checking this fact by proclaiming it obvious that the context of Obama's statement puts the lie to Romney's claim. Other fact checkers supposedly agree. Hopefully one or both of them actually bothered to check some facts. There's really nothing like that in this fact check. It consists of PolitiFact insisting that Obama was taken out of context, and Romney's statements taken out of context make up the bulk of the case against Romney. PolitiFact is partly right. Obama was extolling the importance of the government role in allowing business to prosper. He did so in the context of beneficiary businesses "giving back" as if it wasn't the taxes of businesses that helped pay for the infrastructure in the first place. And the words he used diminish the role of individual effort ("Let me tell you something -- there are a whole bunch of hardworking people out there"). Why does PolitiFact simply ignore the material in Obama's speech that diminishes the importance of the entrepreneur? By leaving out the "individual initiative" reference, Romney and his supporters have misled viewers and given a false impression. For that, we rate the claim False. Romney ignores Obama's "clear summary" because the summary is ambiguous. The summary provides no justification for successful businesses "giving back." That concept comes out as Obama essentially tells entrepreneurs that they were lucky (others worked just as hard) and owe a big honkin' portion of their success to Our Glorious Government. And the government, Obama says, is ready to take its rightful cut. By leaving out the reference to increasing taxes on entrepreneurs, PolitiFact has misleads readers and gives a false impression. Matt Rhoades, Romney’s campaign manager, decried Obama’s "naïve view that government, and not the hard work, talent, and initiative of people, is the center of society and the economy." By neglecting the importance of that context, PolitiFact again misleads readers and gives a false impression. Once again, the subject of the fact check was arguably more accurate than his would-be fact checkers. The fact checks by Annenberg Fact Check and the Washington Post Fact Checker essentially leap to the same conclusions PolitiFact achieved with its leaps of logic. But both of the other fact check services did a superior job to PolitiFact in providing context for the issue. It's worth noting that anytime PolitiFact starts determining whether or not something is "in context", by definition the exercise is one fraught with subjective impressions as opposed to concrete facts. What context is relevant? What objective standard is used to measure what portions should be included, or what element of the speech is unnecessary? One wonders what exactly Romney could have done to satisfy PolitiFact's ambiguous contextual standards. As Twitter user @CuffeMeh suggested, should Romney have hired the fast talking Fed Ex guy to repeat Obama's entire speech in a 30 second ad? For my money, Romney's ad didn't change, distort, or flub Obama's context at all. But there it is, right next to a big gimmicky False graphic. Romney's a liar and I'm a dim bulb because I'm not picking up on the subtle nuance of Obama's delicate context. "Obama video deceptively edits Obama speech to make it sound pro-business"
The bottom line is Romney's ad didn't remove or change anything. This isn't a fact check. It's damage control from a partisan media group attempting to sugarcoat Obama's clear, unambiguous message declaring his attitude towards individual achievement. The Weekly Standard: "PolitiFact Mucks Up the Contraception Debate"
This year has sped by at a breathtaking pace so far, and we've neglected to review some worthy stories about PolitiFact simply because we placed a higher priority on some stories than others. Before I explain why PolitiFact is once again being deliberately misleading, grossly incompetent, or some hellbroth of these distinguishing characteristics, you'll have bear with me. Part of the reason PolitiFact gets away with being so shoddy is that it counts on its readers believing that it can be trusted to explain any necessary context to justify its status as judge, jury, and factual executioner. Obviously the right thing to do now is click the link and read the whole thing for yourself. Hemingway's latest example of PolitiFactian perfidy concerns its use of a Guttmacher Institute publication to support an Obama administration claim that 98 percent of sexually active women use birth control. The Obama administration was trying to justify its insurance mandate requiring birth control as a basic coverage requiring no copay. Hemingway noted the Guttmacher Institute's lack of neutrality, a number of the arguments marshaled against its findings and PolitiFact's selective use of the evidence. At the end of the day, a study drawn from a group of women aged 15-44 does not justify extrapolating the data to the set of all women of any age. PolitiFact went soft again on an administration claim. Ohio Watchdog: "PolitiFact slams GOP spokeswoman for ‘literally true’ statement"
Joe Guillen, the Cleveland Plain Dealer reporter writing for PolitiFact Ohio, was determined to find fault. “The claim is literally true because it includes both Brown and his allies,” Guillen wrote, and he should have stopped right there. If it’s literally true, are we supposed to worry it might be figuratively untrue? It’s a number, not a simile. It turns out that Guillen’s beef is that Santa’s declaration changed the subject. Redfern is the least credible person to be commenting on outside spending when it comes to Ohio’s U.S. Senate race. Sherrod Brown and his special interest allies in Washington are plotting to spend over $13 million, with no end in sight. It’s clear that Brown and his supporters are having to spend this type of money because Brown’s out-of-touch record has exposed him to Ohioans as a 38-year politician and Washington insider who puts politics over people. If the above represents the full context of Santa's response, then Guillen has misrepresented her. Santa specifically wrote "Brown and his special interest allies" and Guillen Sentenceshopped that into "special interest groups" minus Brown. Guillen's paraphrase, in other words, changed Santa's meaning. And Guillen proceeds to fact check his paraphrase and blame it on Santa. Guillen probably shouldn't expect more than a lump of coal for Christmas this year. Rather than interpreting "Sherrod Brown and his special interest allies" contrary to its literal meaning, he should have inquired further as to how Santa justified calling Redfern "the least credible person" to comment on outside spending. Visit Ohio Watchdog to read the whole of Cassidy's report. Big Journalism: "Politifact Yet to Report Two Glaring Falsehoods in Obama's Reelection Doc"
From earlier this year (March), Big Journalism's John Nolte took PolitiFact to task for its kindly treatment of the Obama documentary doubling as a campaign ad. Nolte claimed PolitiFact missed at least two big whoppers in the film. First, GM's supposed repayment of its bailout loans (PolitiFact later graded that claim "Half True"--see below). Second, the repeated tale of Obama's mother supposedly denied health insurance coverage. Politifact took a long hard look at the Obama reelection propaganda film and found it to be … mostly true! Yep, 3 "mostly true's" to 1 "mostly untrue." Yes, PolitiFact succeeded in giving the documentary a favorable frame. One of the claims PolitiFact found "Mostly True" was actually very misleading. It portrayed President Bush as giving the auto companies money with no strings attached while Obama's strong leadership held the companies accountable. The loans from the Bush administration came with plenty of strings, including the requirement that by March the recipients present the Obama administration with a plan for achieving solvency. To PolitiFact's partial credit, it updated its story with a fact check of the claim that Chrysler and GM repaid their loans. PolitiFact fails to receive full credit because the applicable standard doesn't pass the sniff test when paired with the standard recently applied to Mitt Romney. In Romney's case a true statement was called misleading and was ruled "Mostly False." The film made a partially true statement that was misleading and received a "Half True." PolitiFact's combination of story selection bias and biased fact checking served President Obama well. Alternate title: "The unBainable lightness of Bane"
The intermittent "counterirritant" returns with another critique of PolitiFact, this time skewering Poynter's Pedants for ignoring the context of Rush Limbaugh's comments regarding the Bain-Bane connection Limbaugh mentioned on his radio program. The transcript PolitiFact used as a source offers more support for the radio host than it does the fact checkers. 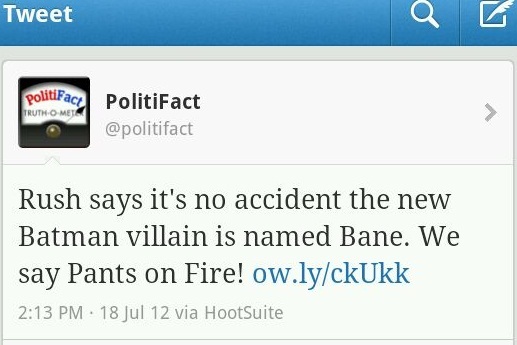 Only two sentences discuss whether the name Bane was selected because of Romney. The first is a question: “Do you think that it is accidental that the name of the really vicious fire breathing four eyed whatever it is villain in this movie is named Bane?” After asking that question, Limbaugh was interrupted and went off on a tangent. 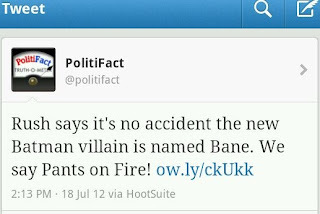 When he returned to the subject, he continued: “So, anyway, this evil villain in the new Batman movie is named Bane. And there’s now a discussion out there as to whether or not this is purposeful and whether or not it will influence voters.” After noting it, Limbaugh never takes a side in the discussion of purposefulness. The point is inarguable: PolitiFact fact checked Limbaugh on a statement he never made, unless one insists without reasonable supporting evidence that his question was rhetorical. PolitiFact didn't bother making the argument and moreover decided against dealing with this issue through its "In Context" feature. "In Context" functions for PolitiFact pretty much like a "nothing to see here" tag. The critique by counterirritant serves as a fine bookend for my "PolitiFlub" critique of the same PolitiFact item. I took a different tack, showing that even if Limbaugh was making the claim PolitiFact imagined the fact checkers went about their business in entirely the wrong way. How can one blame the Atlanta Journal-Constitution for publishing an editorial that calls PolitiFact "a distillery for truth"? The AJC, after all, is one of PolitiFact's state affiliates, the home of PolitiFact Georgia. Blame aside, however, what a load of codswallop. Maybe it’s the clarity it forces on public discourse. Perhaps it’s the eye-catching Truth-O-Meter with its brutal simplicity. Or could it be its distaste for nuance in a world grown comfortable with wiggle room? Anybody else detect a paradox when a device of "brutal simplicity" is said to force clarity on public discourse? The "Truth-O-Meter" and its "brutal simplicity" are a maul used to butcher a steer. Rather than distinct cuts of beef such as sirloin or ribs, one ends up with hamburger blended with all the humblest portions of the unfortunate beast. Hotdog/hamburger hash, as it were. PolitiFact provides all the clarity of Soylent Green, and creates its own rambling vistas of wiggle room. PolitiFact is powerful because it represents the essence of what we do. It is intensely distilled journalism that filters out the good intentions, mendacity and ignorance that lead public officials to fracture the truth occasionally. Like a great scotch, the appeal is in its simplicity. That’s why politicians and power brokers hate it, if “hate” is a strong enough word. Are we talking about the same PolitiFact? I could maybe see the AJC's point if newspaper journalists weren't at least as capable of good intentions, mendacity and ignorance as politicians. The state has so few powerful Democrats, that PolitiFact Georgia has to look to Democrats from elsewhere to avoid giving the impression that it trains its fire only on Republicans. AJC editorialist Bert Roughton Jr. just spilled the beans that PolitiFact Georgia engages in the type of compensatory rating that critics have long suspected PolitiFact of doing. Some PolitiFact operations, such as Ohio's, deny using the technique. So either somebody's not giving us the facts or else PolitiFact's standards vary. We promised to take a closer look at the Republican Party of Virginia's challenge to PolitiFact Virginia's objectivity. The document works on some levels and not on others. The best evidence it contains showing PolitiFact Virginia's lack of objectivity comes from anecdote and circumstantial evidence. The "open letter" section comes across well, but almost immediately afterward the document suffers from accuracy issues. The graph of rulings by number and by party is off, as pointed out by the semi-daily clockwork accuracy of Karen Street: The "False" column for Democrats is too short. The document uses the correct figure for "False" rulings in determining the proportion of "False" statements attributed to Republicans but incorrectly asserts that PolitiFact "ruled disproportionately against Republicans" in that category. The 40 percent figure used in the comparison is disproportionately low compared to the 48 percent baseline derived from the listed numbers. The criticism based on the individual breakdown mostly rings true. Virginia has two Democrats in the U.S. Senate. How does ex-senator George Allen warrant more fact checks than both combined? Complaints about the attention on House Majority Leader Eric Cantor don't carry much weight. Cantor serves as a major voice for congressional Republicans. While it served as an intriguing idea to criticize PolitiFact Virginia for the timing of its stories, we were instantly skeptical of this claim. News dumps by the government are fundamentally different from the news reporting cycle, yet the GOP document relies on the comparison. Here's the problem: Dumping stories over the weekend can put them in the Sunday newspaper, which is often the most widely read portion of a major newspaper. No case is made for the significance of a weekend dump for either a daily paper or an Internet news site. If the Richmond Times-Dispatch literally publishes the most positive Republican stories in its least popular editions then the Virginia GOP may have a legitimate gripe, but that evidence does not appear in this document. The case studies hit the mark more often than not, pointing out a good number of times where PolitiFact Virginia used stilted reasoning to reach conclusions unfavorable to Republicans. The argument from the case study makes PolitiFact Virginia's actions look fishy, but it's far from conclusive without better evidence. It does contribute to the stated aim of the letter, however. This section is at its best when criticizing individual rulings from PolitiFact Virginia. From Page 54 through the end of the 86-page document, the Appendix simply gives a rundown of PolitiFact Virginia's ratings without any commentary or criticism. It's hard to see the point, other than to help produce stories about an 86-page criticism of PolitiFact Virginia. If that was the case, the mission was accomplished. In summary, the report scores with the anecdotes and not much else. The presentation softens the potential impact. The Washington Times: "These three fact-checkers keep candidates in line"
(M)uch of what the fact-checkers do is inherently judgment calls. For example, PolitiFact Virginia will grade a politician's words as true on their face, while other times will look for suggestive meanings that they say make factually true statements unfair. The interpretive bias affecting the story focus is hard to quantify, but finding examples isn't hard. In June, Mitt Romney claimed that poverty among Hispanics increased under Obama. PolitiFact decided Romney was blaming Obama and ruled the true statement "Half True." Also in June, the Obama campaign claimed that Romney, as governor of Massachusetts, outsourced call center jobs to India. But Romney did not outsource any jobs. He vetoed a state law that would have prevented companies contracting with the state of Massachusetts from outsourcing jobs. The PolitiFact rating? "Half True." A true statement is half true depending on the focus PolitiFact gives it. A false statement is half true, likewise depending on the focus. Similar examples occur often throughout the various PolitiFact operations. Ray Allen, a longtime Virginia GOP consultant and adviser to House Majority Leader Eric Cantor, said the entire process is inherently flawed. "So much of what is getting fact-checked is opinion and political philosophy," he said. "The fact-checkers are actively intervening in the campaigns. We've seen fact-checkers write things they clearly want to get in TV ads." Allen's right about the flaws in PolitiFact's process. It enshrines liberal bias from the start through the end of the process. The imprecise rating system provides a versatile canvas for expressing political opinions, no less so as PolitiFact's ratings in practice ignore the definitions of the ratings. The system almost inevitably results in spin. Big Journalism: "Politispin: 'Fact-Checkers' Mislead on GOP Leaders' Favorable Unemployment Numbers"
That's old news around here, but like the liberals who endlessly parrot PolitiFact's spin, we appreciate confirmation bias as much as the next guy. When doing that analysis resulted in Republican governors still reducing the unemployment rate faster than Democratic governors, Politifact decided to compare the unemployment numbers of the Republican predecessors in states that elected Democrats and Democratic predecessors in states that elected Republicans. Only then -- when not even comparing the current crop of governors or the past two years, which was the basis of Elliott’s analysis -- was Politifact able to find something they could use to say Democrats (predecessors) were slightly better than Republicans (predecessors) at reducing the unemployment rate. Lee nails the point, and this reminds me of PolitiFact's treatment of Laura Ingraham's claim about RomneyCare's unpopularity with national voters. In that case, PolitiFact based their entire rating on statistics only from Massachusetts when Ingraham was probably talking about all 50 states. It appears that when PolitiFact doesn't like the initial outcome, they find new facts to throw into the mix until they reach their desired outcome. Considering the unemployment rate has fallen in 49 states in the last year, that’s stretching the statistic pretty thin. We find Robitaille’s claim "is partially accurate but leaves out important details or takes things out of context," our definition of Half True. If the unemployment rate fell in 49 states, by definition Robitaille's claim is true. Using PolitiFact's logic, if Robitaille had claimed "The sun rose in every state that elected a GOP governor", he'd only be rated Half-True because he left out important details. It's nonsense. And it's not fact checking. This is the first time we've noticed Tony Lee, but if this installment at Big Journalism is any indication, we're looking forward to highlighting his work in the future. Head over to Breitbart and read the whole thing. There's plenty more to this smackdown. Matthew Hoy of Hoystory also takes issue with PolitiFact's rating of Robitaille. One might cut PolitiFact a break for trying to take credit into account for the sake of its ratings if the effort was evenly applied and didn't force PolitiFact to largely ignore the definitions it established for its ratings. What do I think of PolitiFact's execution? I'd borrow a line from legendary football coach John McKay: "I'm in favor of it." The Washington Post: "Virginia Republican Party to PolitiFact: Don’t bother ringing!" The Washington Post's reporter/blogger Erik Wemple updates his reporting on PolitiFact Virginia and the critique from the Republican Party of Virginia. It turns out--no big surprise here--that the relationship broke down between the Virginia GOP and PolitiFact reporters. The Republican Party of Virginia joins Wisconsin Democrats in giving their state's PolitiFact franchise the silent treatment. Wemple may have tipped his ideological hand by referring to the GOP's critique as a "screed." Sure, he can claim he just meant it was a long critique. But if he does that then it makes his use of the term appear redundant ("enormous screed"). Careful, Mr. Wemple. State political parties cutting off their cooperation with a fact checker? Looks like the making of a news story. The Franklin Center for Government and Public Integrity is onto PolitiFact, in the form of Watchdog Ohio and its seven-part (so far?) series "PolitiFact or Fiction." Each of the seven parts reviews a questionable ruling by PolitiFact Ohio, with the focus falling on the U.S. Senate contest between incumbent Democrat Sherrod Brown and Republican challenger Josh Mandel. The opening salvo by Jon Cassidy blasts PolitiFact Ohio for rating two nearly identical claims from Mandel differently. One version received a "Half True" while the other garnered a "Mostly True." Cassidy argues that both versions were true and explains the flaw in the reasoning PolitiFact used to justify its "Half True" rating in one case. This installment, again by Cassidy, criticizes PolitiFact's use of softball ratings in the context of its candidate report cards. The report cards graphically total PolitiFact's ratings for a given candidate and PolitiFact encourages readers to compare the report cards when deciding for whom to vote. Rooting for the Red Sox is like rooting for the drug companies. I mean it’s like they have so much money, they buy championships against the working-class, middle-America Cleveland Indians. It’s just the way you are. Brown didn’t pick a dominant pharmaceutical company for his comparison. He picked all pharmaceutical companies, as though we should root against an entire industry because of its size. Since 32 percent of Ohio graduates have no student debt at all, Brown overstated the average debt by half. And that warrants a "Half True" on PolitiFact's "Truth-O-Meter." Supposedly. As with Part 3, Part 4 hits PolitiFact Ohio for choosing a softball issue on which to grade Brown while also giving him an inflated grade. Cassidy points out how PolitiFact's use of equivocal language gets Brown off the hook for using a very misleading statistic. Brown ends up with a "Mostly True" from PolitiFact. The fifth installment adds another example in kind with the previous two. PolitiFact uses equivocal language--well beyond using mere charitable interpretation--to help defend another of Brown's dubious claims. “You’d think it would be as easy as comparing the value of goods and services exported from the United States with those imported from other countries,” [PolitiFact Ohio's Stephen] Koff writes. Note to Koff: it’s exactly that easy. Cassidy could have shown PolitiFact's spin more graphically than he did. For January through September 2010, the most recent measurement available, the trade balance was a negative $379.1 billion. Assuming the monthly trends hold through December, this year’s annual trade deficit should reach $500 billion. Divide that by the days of the year and you’d have a daily trade deficit of $1.37 billion a day. That’s 32 percent lower than Brown’s claim of $2 billion a day. The accurate figure should always serve as the baseline. PolitiFact uses Brown's number as the baseline instead, finding the real figure lower by 32 percent. A 32 percent error doesn't sound so bad. Use $1.37 billion as the baseline and it turns out that Brown's number represents an inflation of 46 percent. In PolitiFact terms, that's "Mostly True." PolitiFact tried to justify the rating based on higher trade deficits from prior to 2009. Cassidy's right again that Brown benefited from grade inflation. With Part 6, Cassidy offers an example of PolitiFact Ohio nitpicking Mandel down to "Mostly True" for a plainly true statement. Mandel claimed his election to the office of state treasurer came from a constituency where Democrats outnumber Republicans 2 to 1. People would understand that to mean a count of voter registration records. PolitiFact justified its ruling according to an expert's claim that voter registration numbers aren't "the best litmus test." But think how much more context was missing from Sherrod Brown's statement in Part 5. There's no comparison. In Part 7 Cassidy switches gears and defends one of Brown's statements from the truth-torturers at PolitiFact, but uses the minor slight as a contrast to yet another example of grade inflation. We’re not sure which half. If you take out the middle four words, “we buy… Chinese imports” is true. You can argue Brown’s claim is close enough, or that it’s way off the mark, but whatever you call it, it isn’t half-true. But while PolitiFact Ohio isn’t looking to play Gotcha!, a key tenet is that words matter. In this case, Brown’s number is nearly 30 percent greater than the correct figure. Yes, words matter. PolitiFact uses words that suggest the accurate figure was used as the baseline. But the math tells a different story. The 10 percentage point difference between 25 percent and 35 percent is nearly 30 percent of Brown's incorrect figure--the wrong one to use as the baseline. In fact, Brown's number is 40 percent greater than the correct figure. Overall, Cassidy did a fine job of assembling a set of PolitiFact Ohio's miscues and explaining where the ratings went wrong. When PolitiFact botches the math on percentages, as we point out, it helps out Sherrod Brown all the more. We appreciate Ohio Watchdog's contribution toward holding PolitiFact to account.